I've Seen The Photography Light. Photography is a vast subject and has many complexities both in terms of technical functionality and artistic interpretation. It can also be as easy or hard as you want it to be. You can take great pictures with a camera-phone. Point and shoot. You are done, you have a picture in the bag. You can start to move up the scale and take pictures with ever more complex cameras and spend thousands of pounds on specialist equipment. You can learn all there is to know about the techniques of capturing a photograph and become a technical wizard with a light-recording device (for that is all a camera is) costing many thousands of pounds/dollars/euros and yet the pictures are still dull and boring. This article isn't about the technical aspects of photography, it's based on experience and lessons learnt over many years of shooting the outdoors. Light is what makes your picture happen and without it there’s no image. A photograph is only the capture of light reflected off your subject, this is what you see and what your camera records. There is enough to discuss on the single topic of light to fill a big book, packed with stuff about how you use it and also how you don’t. So this little entry isn’t going to do any kind of justice to the topic at all. However I would like to pass on just a little something of what I have learnt about light. Not just any light but natural light from the big ol’ Sun up there. My favourite type of light. Of course you could spend your entire photographic life using artificial light from strobes or bulbs without ever using the Sun but, if you like me, love real Sunlight then read on. Light from the Sun changes every second as the Sun rises, passes overhead to Midday and continues on it’s arc through the afternoon and ultimately to setting in the West. If you want to add a technical aspect to this, then look up ‘light temperature’ for this describes the light quality which varies with the time of day. You can also measure light temperature of artificial light too but that’s a whole new subject. I would recommend you look up light temperature for future reference. The white-balance setting on the camera is how you set up the camera to accurately capture the light dependent upon the light temperature. Natural light has a blue and cold cast, however this changes at different times of the day. At sunset the cast is very warm and orange. (For completeness, artificial light from a tungsten bulb is also very warm and has an orange cast. Artificial LED lights can have a cast similar to daylight). If you shoot in RAW, you can take the picture with any white-balance setting and then adjust it when editing. It's interesting to use different white-balance settings in editing to see how these change the look of the image. If you point your camera at the same subject and take a picture first thing in the morning, mid-morning, midday, mid-afternoon and then at dusk, you will see how the quality of the light (and the word quality is important here) changes as the Sun moves across the sky. This is the light temperature changing to give a different colour cast depending on the time of day. It is generally acknowledged amongst most landscape photographers that the quality of light is at its best first thing in the morning and at the end of the day. That’s because the Sun is lower in the sky and the light is softer, gentler, offering a pleasant glow to the subject. If you look at an image taken at midday when the Sun is at it’s highest you will notice it is very harsh with no shadow. I don’t know of many great landscape images that work when taken at midday. That’s not to say it’s not possible. I have seen photographs where the bright midday light has enhanced an already barren landscape but these are very specialised images. The sky at dawn and dusk usually has more detail to offer the landscape photographer. Compare the dawn or dusk sky with a midday sky. I find that a midday sky is very hard to work with. I like to capture detail in my skies to enhance a landscape. If the sky is not right I will not take a photograph. 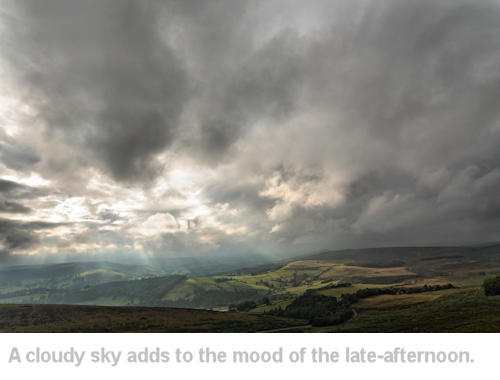 (Which can be a pain) I prefer to return to a location at another time when the sky will offer more to the image. This usually means returning early in the morning or late afternoon. Remember though that you should note where you expect the Sun to be when you return so that you can be sure the Sun lights your subject in the best possible way. You don't need sunshine to take great portraits. A cloud-covered sky makes a wonderful diffuser for sunlight and images shot in these conditions have much lower contrast, revealing details all around the frame. 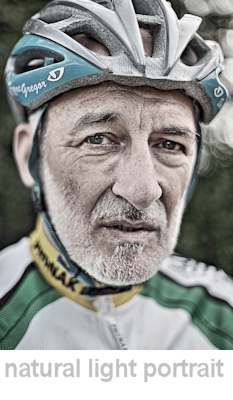 Take the shot of our cyclist here, this was shot in just such conditions, with a 50mm lens. No flash required. This shows how you can take interesting work with the right subject and the right light. Almost any subject can benefit from this diffused light but if you wish to include the sky it will be bland and featureless. I guess you can't have it all ways! It's worth experimenting with shooting the same scene in different light to see how this effects the look of the shot. I do like the reduced contrast of that bland sky and how more detail is revealed in the far fewer shadow and highlight areas. Sometimes though, that stark direct sunlight can add a mood of it's own so this is something to play around with. Bad Light Doesn't Stop Play! You don’t need sunlight to take great pictures. Some of my favourite images have been taken in fog, in rain. 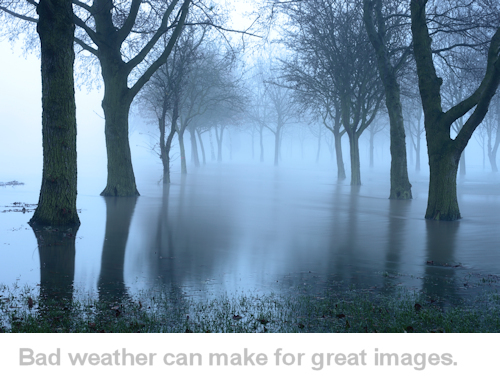 The trees caught up in a flood were photographed on a very foggy day and this has created an amazing moody image. It's all too easy to look out of the window and see that it's cold, damp and miserable and human nature tells you to stay warm and cosy indoors but really this is a great opportunity lost. Bad weather makes great images! Obviously there's a need for some preperation to go out and shoot in bad weather. Always expect the worst and have cover for your gear to keep it dry. There are many specialist camera covers on the market to suit every kind of budget and camera combination. In the past I've even made a plastic cover which was held together with a bulldog clip. It wasn't elegant but it did a job. Carry your gear in a suitable bag designed for bad weather. Of course the photographer should be well-prepared too. There's nothing worse than being cold,wet and miserable in bad weather. Feeling dry and warm is more likely to encourage you to stay out there and get these kinds of shots. However always be careful and think safety first in all conditions. Consider how the weather can change and be prepared for the worst. If things are too bad go back another day. No photograph is worth risking your life. 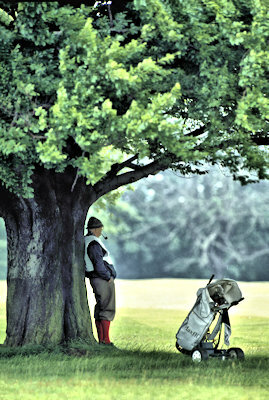 The golf caddy image below was taken in pouring rain. He's sheltering under the tree and without these crappy weather conditions I wouldn't have got that shot. Remember, these images were still lit by natural light, just in different ways. Sometimes you have to make the best of the light you are given when you are taking a shot. It’s useful to be ready to work in any quality of light as this gives you maximum opportunities for your image capture. So to sum up here, when you have learnt the basic techniques of using a camera and wanting to move past just pointing and shooting, one of the first things I would suggest you think about is the light and how to use it. How you want it to fall on your subject, how you want your camera to see the subject in the light and when is the best time to get the natural light you want to achieve your desired photograph. Never stop learning about how light effects your image. I have been taking photographs commercially for 15 years and even today I learn something new everytime I pick up my camera. Appeciating how light can change your photograph means your final images will be closer to how you imagined them to be before you pressed the shutter. It's a skill in itself to keep an open mind to always learning, experimenting and never assume you know all there is to know. Don’t get sucked in to thinking that buying loads of expensive gear will improve your photography. Get sucked in to the idea of learning about it and appreciating the finer points of light capture. After becoming comfortable with using natural light, the next area to look at is mixing natural light with flash. That though, is for another day and another article.